Our mission is to ensure we deliver the highest quality, most cost-effective services, and equipment to our patients. Furthermore, we want to maximize independence, limit or prevent hospitalization, provide significant relief of symptoms, and promote safety. In addition, our products will meet the expectations of patients, their families, and the health care communities. 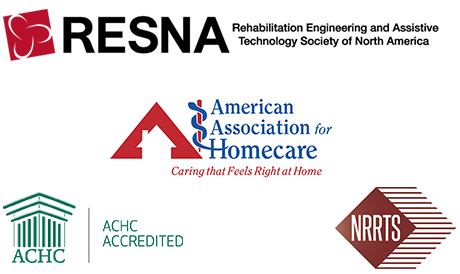 Our goal is to constantly be at the forefront of the rehabilitation industry. We strive to provide the best quality of products in order to improve the daily lives of our patients. Our vision is to provide patients with medical equipment so that they can live their lives with no restrictions. We envision our patients to live a healthy, positive lifestyle so that the world can be a better place. All services that we provide aim to ensure quality so that we can provide continuity of service to clients. Ability Medical Supply is a member of the Rehabilitation Engineering and Assistive Technology Society of North America. We’re also accredited by the Accreditation Commission for Healthcare. We are licensed and connected with the state of Florida and Medicare. Ability Medical is also a dedicated partner of The ALS Association Florida Chapter since 2008 and bringing you a combined 75 years of excellence in the Rehabilitative Equipment field. Above all, our experience has allowed us to perfect our profession. In truth, we provide our patients with excellent service and the most personalized equipment available. We value the quality of being honest and having strong moral principles. We ensure that every client, caregiver, and health care provider can depend upon efficient, knowledgeable and reliable assistance. We embrace continuing education, licensing and accreditation and just as importantly our people skills to develop, learn and embrace our core values. We dedicate the time and effort to safety check all equipment and communicate and report at the end of each delivery and each day. Ability medical has demonstrated a commitment to providing quality care and services to consumers through an agreement with all nationals recognized Standards and Accreditation. Ability Medical also has complied with rules and regulations made by the State of Florida, Agency for Health Care Administration, and is authorized to operate.